Tottenham Hotspur took a big step towards Premier League 2 Division 1 safety with a 4-2 home victory over Derby County. Josh Barnes' own goal put Spurs 1-0 up in the ninth minute, the first of five goals in 22 first-half minutes. Joe Pritchard doubled their advantage, before Cameron Cresswell struck twice in two minutes to put Derby on level terms. 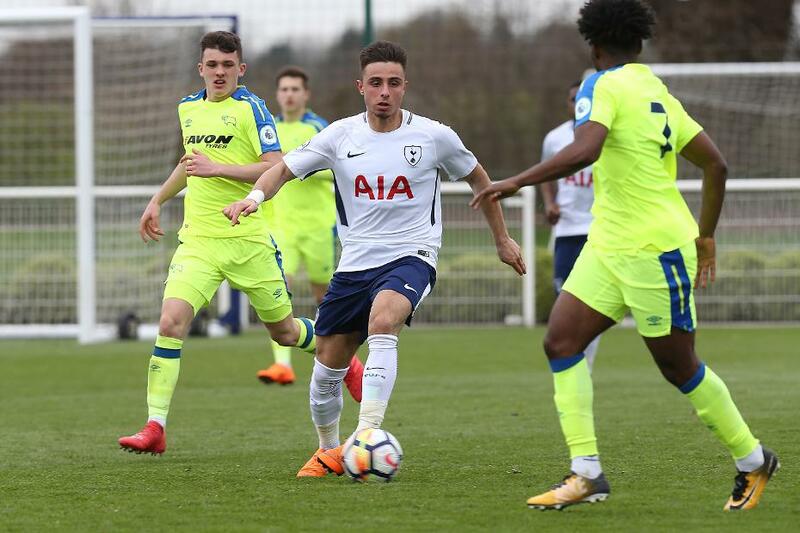 Anthony Georgiou (pictured) put Spurs 3-2 up on 31 minutes, before Kazaiah Sterling wrapped up the win with a penalty in second-half stoppage time. The win extends Spurs' unbeaten run to six matches and puts them four points clear of the relegation zone with two fixtures left. Derby slip below Spurs into 10th position, two points above the drop zone.